Bagels and lox are wildly popular and easily assembled at the last minute for any event, but several years ago, I began adding Sephardi dishes to our buffets. Not only healthy and colorful, this cuisine pairs well with bagels and lox. My husband’s family are Italian Jews and they love pesce all’ebraica, which is baked fish with a sweet-and-sour sauce. 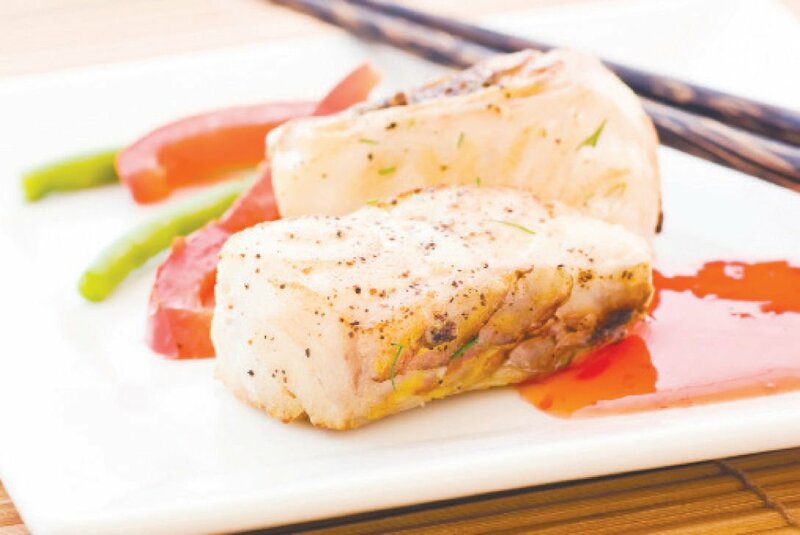 I prepare this recipe with red snapper, which is readily available in America. This piquant dish is an excellent way to introduce Sephardi food to the usual smoked fish menu — a way to bridge a cultural gap. The ultimate in hard-boiled eggs, hamine, originated in Egypt’s ancient Jewish community. But today they are sold by street vendors in Israel, where hamine epitomize Sephardi food. These eggs are slowly simmered for 6 to 8 hours until their yolks turn creamy and their whites take on an attractive sepia tone. Hamine are eaten at births, deaths and to break the Yom Kippur fast, similar to the role smoked fish plays in Ashkenazi tradition. There are many other Sephardi specialties to serve; some are salads and dips, others are warm dishes. Selecting any one of them sparks conversation and adds a delicious dimension to any buffet table. Ask your fish monger to debone the two red snappers and cut each one into 4 pieces, 8 pieces in all. The skin should stay on. Whisk together the vinegar, wine, oil and honey until the honey dissolves. Stir in the raisins and let them soak in the liquids for 15 minutes. Preheat your oven to 350 degrees. Coat a 9-by-13-inch baking pan with nonstick spray. Rinse the fillets under cold water and dry them on paper towels. Move the fillets to a large platter and sprinkle them with salt and pepper. Place the fillets skin side down in the prepared pan, overlapping slightly. Whisk the vinegar mixture again and pour it over the fillets, evenly coating them. Place the pan in the oven and bake for 15 minutes. Baste every 5 minutes. Sprinkle the pine nuts over the fillets and continue to bake for another 5 minutes, or until the fish flakes when pierced with a fork. To serve immediately, place the fish on a platter and spoon the sauce over the fish. To prepare a day in advance, cool the fish to room temperature, cover the pan with aluminum foil and refrigerate. Return the fish to room temperature. Cover with foil and reheat in a 350-degree oven for 5-10 minutes until warmed through. Rinse the lettuce under cold water. Break the leaves into bite-sized pieces. Briefly dry them in a salad spinner or on paper towels. Place the lettuce in a large salad bowl. To make a day ahead: add the tomatoes, cucumber, yellow pepper, celery and olives to the salad bowl, layered in paper towels. Cover with plastic wrap. When ready to serve, remove the paper towels and plastic wrap. Add the remaining ingredients and toss well. Serve immediately. Place the eggs, onion skins and oil in a large pot. Pour in enough water to submerge the eggs in 4 inches of water. Cover the pot. On a medium-high flame, bring the water to a boil. Reduce the flame to its lowest possible level. Move the lid so the pot is uncovered a crack. Simmer for 6 hours. Check every 30 minutes to make sure there is enough water in the pot. Add more water when needed. Drain the eggs in a colander and rinse under cold water to wash off onion skins. Cool to room temperature. Crack the eggshells and discard. The egg whites will appear marbleized in shades of brown. Slice the eggs or cut them into wedges. Place them on a platter and garnish with parsley, if using. Serve immediately or cover them with plastic wrap and refrigerate until serving. Note: This salad should be made 24-48 hours in advance. Cut a circle around the stem of the pepper. Pull out the stem and discard it. Rinse the inside of the pepper under cold water to get rid of the seeds. Drain on paper towels. Dice fine. Reserve. Cut out the cores of the tomatoes and discard. Cut the tomatoes into wedges and then coarsely chop them. Reserve. Place the bulgur in a large bowl. In a small bowl, whisk together the olive oil, lemon juice, salt and garlic. Drizzle this mixture over the bulgur. Cover the bulgur with a layer of diced onion, followed by layers of parsley, the orange pepper, dill, olives, cucumber and tomatoes. Cover with plastic wrap and refrigerate for 24-48 hours.